Yoga and cancer sometimes end up in discussions with my wife Karri, who is a nurse as well as a certified yoga instructor. So after another one of these conversations I decided to hit the databases to learn about the state of research of yoga in pediatric oncology. While the results are pretty slim, the encouraging situation is that there is yoga research emerging that attempts to scrutinize yoga in children with cancer. The article I am elaborating on today by Thygeson, Hooke, Clapsaddle, Robbins, & Moquist (2010) examine the consequences of peaceful play yoga in children with cancer and their parents. Investigate whether or not a single yoga session could reduce anxiety in children with cancer and their parents. 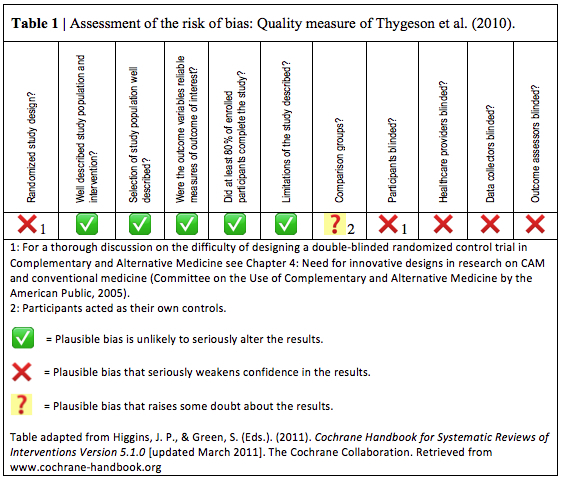 Thygeson et al’s. (2010) study design called for 3 groups. One group of patients ages 7-12 years old, one group 13-18 years old and one parent group. Children were all diagnosed with cancer or a blood disorder. Parents met the inclusion criteria if they had a child of any age hospitalized on an inpatient unit with a diagnosis of cancer or blood disorder. Parents also were able to participate with or without their child. Thygeson et al. (2010) chose mixed-methods (please see my note about mixed methods research at the end of this entry), within subject, repeated measures design. The researchers collected pre- and post-study measures immediately before or after the 45-minute yoga session. Anxiety and sense of well-being were assessed with the State Trait Anxiety Inventory (STAIC). An open-ended survey to assess qualitative data was administered shortly after the yoga session. Ten children, 5 teenagers and 32 parents completed yoga session. 64% of children were male, 60% of teenagers were male, 70% of participating parents were female, and 42% of parents participated in the research and yoga session with their child. Nineteen parents participated with a child less than 6 years old. The children (n = 11) reported no change in their anxiety or sense of well-being (p = .21) Teenagers (n = 5), on the other hand, experienced a significant decrease in anxiety and improved sense of well-being (p = .04). Parents experienced a significant decrease in anxiety as well as an increased awareness of well-being (p < .01). The Children: Four themes emerged from the children’s group. Mainly, yoga was fun, relaxing, yoga helped children feel calm, and yoga helped children feel good. Thygeson et al. (2010) quote one child who said: “Very fun and really relaxing and like it calms you down and stuff” (p. 280). The Teenagers: In addition to the four themes emerging in the children’s group, the teenage group identified an additional theme: Yoga as self-care. One teenager described yoga as a form of self-care that it yoga helped “managing stress more effectively” (Thygeson et al., 2010, p. 280). “The body becomes stronger and more balanced,” and the experience was “strengthening emotionally and physically” as well as “all the anxieties you feel in the hospital melt away” (Thygeson et al., 2010, p. 281). Is it any wonder that six parents recommend yoga to other parents? According to the Thygeson et al. (2010) study the child sample might not be representative of a typical inpatient hematology/oncology unit. It is not known how long the participants were able to sustain the benefits of yoga. Study design did not involve randomization of participants. Even though, participants acted as their own controls, future research might include an active “attention” control, to minimize the likelihood that the extra attention yoga participants received contributes to the positive results. While it is difficult to blind participants and yoga instructors, future research in this field might contain a design that blinds data collectors and data assessors. Thygeson et al. (2010) research is tremendously encouraging. As mentioned by the authors, at the time of their research there were no other studies available that looked at yoga in children with cancer and blood disorders. They laid crucial groundwork with this study. Further investigation is warranted to investigate the effects of yoga on children with cancer and their parents. In smaller children with cancer, the effects of yoga on anxiety and well-being are not clearly understood. If your child is up for the physical movement, yoga might contribute to effective bonding time. In teenagers with cancer and parents of children with cancer, Hatha yoga might contribute to a general sense of well-being and reduced anxiety. While yoga will certainly not solve all your problems, as a parent of a child with cancer you might, however, experience the sensation of, as one parent put it: “it is like going on a mini vacation from everything else going on” (Thygeson et al., 2010, p.281). The study was performed at the Children’s Hospitals and Clinics of Minnesota. The authors declare no conflicts of interest and no financial support for the research was received. Utilizing multiple methods (e.g., intervention trials and in-depth interviews); Intentionally integrating or combining these methods to draw on the strengths of each; and Framing the investigation within philosophical and theoretical positions. In mixed methods research, the qualitative data provides a clarification of the quantitative outcomes. Thus, rather than just focusing on numbers, a mixed methods design allows for integration of a variety of theoretical perspectives, adding context and meaning of human lives and to the human experience (Creswell et al., 2011). Life is full of events which we have no control over and to which we are vulnerable. The important thing to remember is that we can choose how we cultivate our thoughts and what eventually will get our attention. We ultimately decide how we interact with the world around us and ourselves. For entrainment music to be effective in altering the mood state, the music needs to be first matched to the current mood state, and then slowly the music needs to move and match the desired mood state. When used properly, entrainment music has been proven to be effective in significantly reducing pain, tension, depression, anxiety and greatly contribute to an improvement in general mood, energy levels, and cognitive tasks. Support groups are applicable in a wide range of purpose, including psychologic therapy, weight loss, grief work, and personal development. The patient should decide if a support group would be helpful and if he/ she can commit to attending and working with a group. The topics we have covered and the research we examined so far, the following themes contributing to health become apparent. All the above have lasting implications on overall health and well being. A person feeling in control of his/ her life and well being combined with a sense of purpose are also very critical to overall health and well being.